The 12 oz. 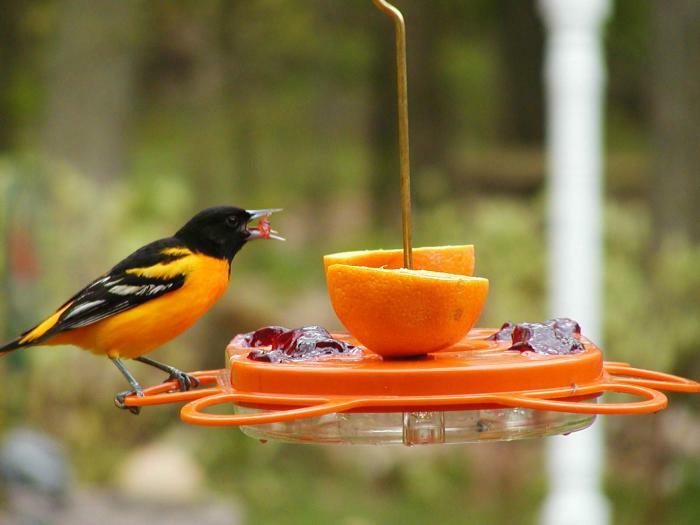 Oriolefest Oriole Feeder will quickly become a favorite part of your birdwatching routine as you watch it draw in the colorful orioles. Because the feeder is from Birds Choice, a company committed to manufacturing the highest quality professional outdoor products to enliven your life and bring nature's finest songwriters to your yard, you know exactly the type of product to expect. Custom-made to accommodate the types of foods the orioles enjoy, such as fruit, nectar, jelly, and mealworms, it's also easy to clean and features a built-in ant guard to keep your offering as fresh as possible. Just fill it up and watch the festival begin! Also works great for catbirds, flickers, woodpeckers, cactus wrens, and even hummingbirds. Very happy with my purchase. Easy to fill the jelly trays versa the older style I had. Excellent product, well made. Fair price, fast delivery but shipping was to expensive. Liked it, took birds a few days to get use to. 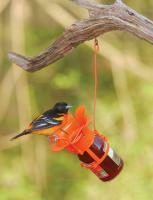 We love this oriole feeder. We replaced a similar one that had been damaged in a storm. For whatever reason, our orioles love this design and they visit regularly. We've tried other designs and they seem to ignore us. Thanks for offering this feeder and for the ease of ordering and quickness in delivery. We are having so much fun watching the orioles feed. Also, House Finches like it. The Grape jelly goes fast. They also feed on the orange half. The humming birds prefer their own feeder. By Dixie N. from Il. It works fine - just sorry orioles don't stay in area longer. I have been having a Baltimore Oriole family eating at my feeder. See them most days. The feeder seems to be doing it's job. It's also easy to assemble and clean. I really love this feeder. The Orioles use it everyday and now the Redpolls are using it also. Neat little feeder! I love the fact thst I can feed nectar,mealworms,oranges and jelly all at yhe same time! Its May and I still have Orioles at this feeder! First time I used this feeder was the first time I tried to attract orioles. They came within two days and every day after. The oranges and grape jelly worked best, they drank just a small amount if nectar. Love this feeder! The grape jelly dishes are bigger than most. It's nice that the orioles can choose from jelly, orange or nectar. The finches like to eat the jelly too, & the hummingbirds eat the nectar on occaision as well. This is a great item. I like the extra big spaces to hold jelly. The orioles love it. We attracted at least 4 families. I refreshed it every day. The only negative was the flies that got in the nectar. The ant moat must have worked for ants. It took a while, but the Orioles here in the Texas Hill Country have warmed to this feeder. They don't seem interested in a fresh orange half, but love the nectar and grape jelly. Finches eat the jelly as well. For some reason unknown to me, when the Orioles perch on this feeder, they sing between gulps. I haven't observed this behavior on my other Oriole feeders. It's delightful!! Although we have yet to attract any orioles to our yard, I rated the feeder a 5 because I don't believe the problem lies in the feeder. 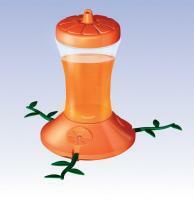 It is very well designed, allowing you to offer nectar, jelly, and an orange half. It looks good and it's also very easy to clean. Can't ask for more than that! Also, delivery was very prompt! I had 2 units shipped to New Zealand. They both arrived in a timely manner, however, one unit had a manufacturing fault. I sent an email advising of the situation not really expecting a reply since I was on the other side of the world and they had got my money. Well I was very much mistaken I received a reply and subsequent advice that a replacement part was on its way. Today that part arrived - problem solved. The bird feeders are great and the Company is awesome in my view. Everything exceeded my expectations. Thank you. PS. We don't have Orioles in New Zealand but the Wax Eyes are loving it and I'm hoping that come next winter I can have Tui feeding from it as well. This feeder was purchased too late in the season for orioles, but nevertheless attracted hummingbirds. It is easy to set up but some bees did get in. Grape jelly works great in attracting birds.I will get it ready by May 1st next year. Great job! Keep up the good work and customer satisfaction! This was a replacement feeder for one that broke. We've been using this style feeder for years. The orioles come back to our yard and feeder every year in May to raise their young. 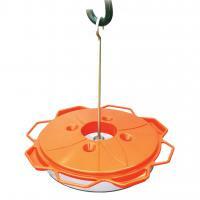 They love this feeder because you can put fruit or jam in it too. It also attracts house finch--they love the jam too. We love this feeder! We have at least 4 pairs of Orioles that come to our feeder. It is easy to clean and refill. The orange Baltimore Oriole feeder works great! 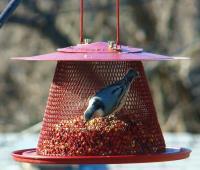 In about ten days we started seeing them on the feeder. They became so regular I could set up my camera on a tripod and I got some great pictures. Within another few days both males and females appeared throughout the day. We were replacing the oranges and the grape jelly every other day! I am ordering one for my five year old grandson's birthday in June. I was a little disappointed with the size of the jelly indentations. My Orioles will have the jelly eaten from those in an hour!! It is working fine and we are getting a lot of orioles on it. The only complaint is not being able to get enough jelly on it. Some is lost in the water mote part. The Orioles used the feeder, and it was convenient to hang. Wish it had a bigger area for the liquid food. It is easy to clean. Had more Orioles this year than in the past. We were hoping an Oriole would be attracted to the feeder, but alas, I think it was too late in the season. We filled it with hummingbird juice and they drank the substance as did the bees and when we went to clean it we also found two dead bees inside. We'll set it out earlier in the spring. Works well, the orioles love the jelly and oranges. They don't seem to be all that interested in the nectar, so we stopped putting nectar in. There are orioles in the area but they haven't found the feeder yet. Hope they do soon. The orioles and hummingbirds love this feeder. When the cups are filled with grape jelly the finches flock to it too. I gave it 4 stars instead of 5 because I'd like to capacity to be a full 16 ounces instead of 8 - 10. Our Bullock Orioles like this feeder, therefore I like it. However, the flies like is as well! The depressions for holding the jelly could be deeper as I have to fill it twice a day to satisfy only 5 known Orioles in the area. The method of displaying an orange half is a good idea. I watch the birds extensively, and have never seen them show any interest in drinking the nectar in the bottom container from the openings in the orange top. So I eventually just filled it with water. Perhaps they get enough moisture from the orange and jelly. It is a nice looking feeder - but we have 4 Orioles and none of them have ever used the nectar feeder part of the setup. So it is a rather expensive way to set out grape jelly! It was received in record time..unfortunately, it was the 2nd one I used for oriole feeding and apparently the first one ( a different model) was preferred by the orioles. They never got near this one as it was hung about 5 weeks after the original. I shall hang it FIRST next year! The concept is good, with the jelly holders, but there are NO bee guards. The wasps and yellow jackets chased all the orioles away. There ended up being 4 dead yellow jackets inside the feeder. I had to purchase another feeder with bee guards. Very disappointing. I was pleased with the product but as each week goes by I see it does not live up to its description. The insects get into the sugar water reserve and not just the small water area as stated. The metal rod that holds it together is getting pretty gross from having an orange poked through it despite regular cleaning.